When local strawberries hit the farmers' market, I start contemplating all the ways I want to eat them before the season ends: over waffles and pancakes, smashed on toast, coupled with rhubarb in a crisp, dunked into sour cream and brown sugar, and, of course, with shortcake. This recipe is an amalgam of favorite recipes and flavors, with a variation to substitute Greek yogurt for whipping cream. 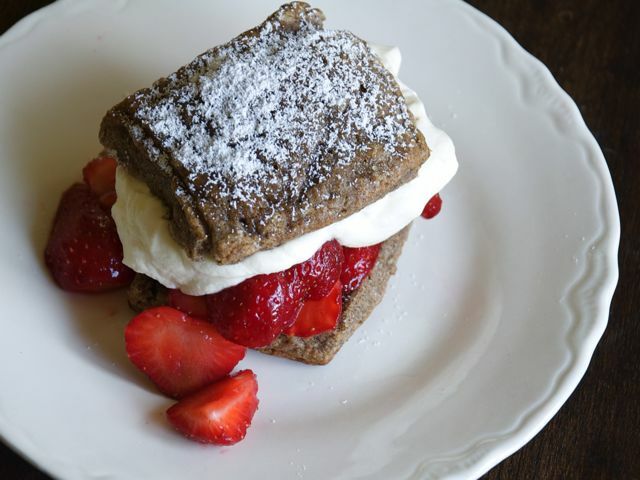 Don't dismiss the buckwheat shortcakes until you try them; I took a platter to a recent party and watched dubious eaters turn into buckwheat gluttons. Wash, hull, and slice the strawberries. In a large bowl, mix together the sliced strawberries with a tablespoon of brown sugar. Allow to sit for at least 10 minutes at room temperature, to draw the juices out of the berries. In a medium bowl, whip the cream until it begins to thicken. Add a tablespoon of brown sugar and continue to whip until very soft peaks form. Split the shortcakes and distribute them among individual plates. On the bottom half of each biscuit, ladle a large spoonful of strawberries. Spoon a dollop of whipped cream or Greek honey yogurt over the berries. Top with the remaining biscuit half and a dusting of powdered sugar. Serve immediately.